Just because it's small doesn't stop the Ruark R1 Mk3 from being one rockin' radio. If you're in the market for a small scale radio with big scale audio then the Ruark Audio R1 Mk3 should definitely make your shortlist. It doubles as a Bluetooth speaker (albeit not a wireless one), is a doddle to setup and use, and sounds fantastic. We've wanted to pop a small DAB radio in our newly built kitchen in order to catch some BBC Radio 6 and treat the ears to new tunes while cooking for some time. During said kitchen's construction, however, we've been treated to the delights of what we can only describe as "builders' radio": an odd paint-drenched plastic box that sounds about as rattly and joyous as a chorus of detuned recorders played by five-year-olds. Enter the third-generation Ruark R1 radio and it's like listening to the Royal Philharmonic Orchestra by compare. Small scale enough to fit away discreetly without eating into too much worktop space, but simultaneously good-looking enough to sit proudly on display. Is this our dream DAB? Not that we've been listening to much classical music. You might think that a small box such as the R1 Mk3 - it measures 170 x 130 x 135mm - isn't capable of delivering much audio grunt, but it's quite the opposite. The first time we popped this little radio on - a simple tap of the on/off button up top aids that - there just happened to be some Beyoncé bounding over the airwaves. And bound it did indeed via the Ruark: all bassy and deep, with the vocal cutting through nicely. It's like the Ruark R1 Mk3 is a magic little box at kicking out the bass, especially when considering its ability-to-size ratio. We've been through all kinds of genres in our exploration of the various DAB radio channels on offer and everything has sounded top notch. Tracks are of course mastered for radio play and so designed to sound a certain way, but the Ruark lets them shine. Volume, which is controlled using the turn dial on top of the radio, hits heady heights too. Distortion hasn't been an issue and we've found signal reception great even without the screwn-in aerial extended. It does extend a long way if needed, which makes it look like something from the 50s. There's no included remote control, however, which for those dealing with larger spaces might be a downside. Not that the R1 is just a radio, as that would limit its appeal hugely for those seeking a more versatile stereo system. Also on board is Bluetooth for synching a phone, tablet, laptop (or whatever else you may use as a source) in order to pump your personal tunes out through the 3.5-inch speaker. So in that respect the R1 Mk3 is a hard-wired Bluetooth speaker. With its aptX certification the quality matches CD quality - assuming, of course, your source files are that good (MP3s, technically speaking, aren't) - for seamless playback without compromise. There's also A2DP support, which is like a handshake between synched device and receiver. So if you want to skip a track, for example, you can do it using the forward/back arrows on the R1 itself, or go back to the source phone/tablet instead. You'll also get a full sync of track names and so forth, ensuring full details are shown on the OLED display. It's a total doddle to setup the R1 Mk3 too. Indeed, it's probably the quickest Bluetooth pairing that we've ever had with a product. You know how it can sometimes take 60-seconds for a phone to find a speaker, or for a laptop to communicate with a phone? No such issues here: the R1 Mk3 was found and paired with our LG G4 handset in about three seconds flat. The Bluetooth "button" on the front of the device isn't a button at all though, it's just fashioned to look like one for some reason. It doesn't even light-up. You'll need to refer back to the Source button on top of the R1 to acquire a Bluetooth connection. The inclusion of that built-in OLED display means you can always easily see where you are within the menu system, what's playing, and the current time. It's a simple display, but very clear in its delivery. Disconnect the power and it does take a short moment to relocate the current time sourced via the signal, but it does ping back into play within a few seconds. In addition there's a 3.5mm line-in to the rear, and if you can't receive DAB signal then there's an FM tuner too (DAB+ is supported for the future too, if we ever see the fruits of that). Again, hitting the Source button and then depressing the volume dial confirms selection. If you're more likely to use the R1 Mk3 as a bedside radio then there's an alarm option (the sleep button is poorly placed though), while a USB port means power output to charge a smart device is also available. Sometimes waking up to radio is better than the incessant quacking of that darn duck iPhone alarm, it has to be said. The R1 Mk3 isn't quite perfect though. Why oh why is a giant wall plug necessary? Presumably it's the transformer within, but it's too big and therefore a little tricky to hide from view. We like the overall design, but the walnut finish (white and black lacquer options are available instead) won't suit all tastes we suspect. The same can be said for the retro look, but we found the walnut complemented the black and silver trim in our sample unit. However some of the plastics look a little too evidently so - and given the £199 asking price, that's a point worth raising (plus the Mk2 product was a touch cheaper). It's also worth pointing out that the R1 Mk3 needs to be tethered to the wall; without direct current it won't work at all. Unless, that is, you buy the £50 BackPack for added mobile versatility. Lastly, and it's an obvious point perhaps more than a criticism, is that with a single output point you're not going to get proper stereo. And with more wireless Bluetooth speaker makers designing units that can be be purchased in pairs and defined as left and right speakers, that's something that this Ruark will never be able to muster. It does offer stereo headphone output though, if you happen to want to wire up to the 3.5mm output jack to the rear. 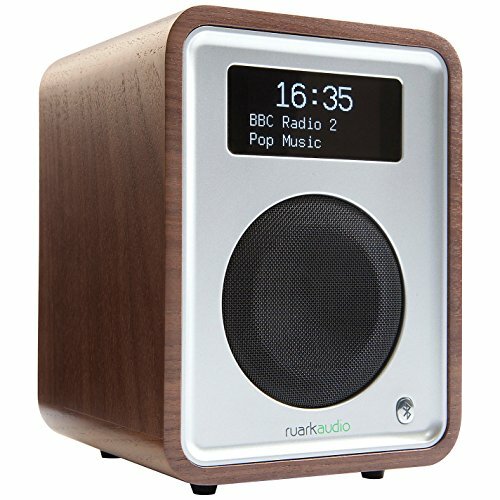 If you're in the market for a small scale radio with big scale audio then the Ruark Audio R1 Mk3 should definitely make your shortlist. It doubles as a Bluetooth speaker (albeit not a wireless one without the optional BackPack accessory), is a doddle to setup and use, and sounds fantastic too. The design might not suit all tastes, and the wall plug is huge, but we rather like the walnut finish model we've been testing - it accents our kitchen oak worktop rather nicely. However, at £199 this DAB radio is pricier than the earlier Mk2 model and that might be seen as a stretch by some. Just because it's small doesn't stop the Ruark R1 Mk3 from being one rockin' radio. It's laid to rest our radio apprehension courtesy of builders' radio, and we now look forward to cooking up a treat with a bit of DAB blaring out in the background each evening.